In Ireland, they supposedly send new mums home from hospital with a Guinness. We'd always thought that if this was in fact true, it must be for the iron and B12. However, it seems that Guinness is called "Mother's Milk" as it reputedly aids in bringing on the milk production. So as I was still waiting for my milk to fully come in, another well-knowing midwife suggested that if I liked stout, I should have a glass. Any excuse hey? 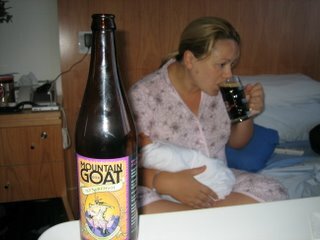 Now it just so happens that Cory had brought in a bottle of Mountain Goat's Old Surefoot Stout, June '03 vintage. Now although beer is generally better served fresh, bottle fermented beers can age well. Cory had brought this in to wet Genevieve's head - but little did we know that it would serve a higher purpose. The next day, my milk slowly started to come in. It could have been the stout - it may have been happening anyway. But who cares, it tasted good. Still all fresh and roasty, like eating grains of chocolate malt.